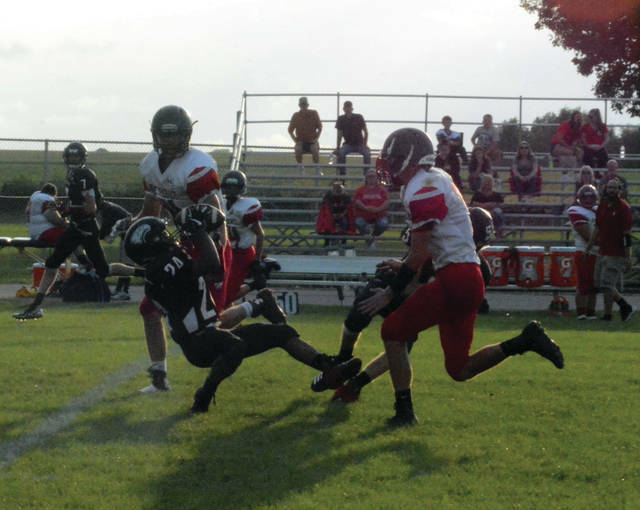 Will Hall (37) finds a hole to run through for Mississinawa Valley in its final scrimmage game Friday night against New Lebanon Dixie. Quarterback Trent Collins (2) throws a pass during Mississinawa Valley’s final scrimmage game Friday night against New Lebanon Dixie. Josh Fett (24) makes a catch for the Blackhawks during their final scrimmage game on Friday night at home against New Lebanon Dixie. 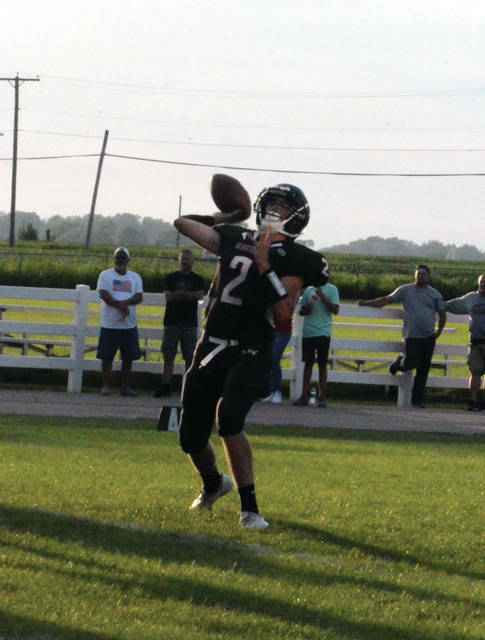 UNION CITY – The Mississinawa Valley Blackhawks capped off their preseason with a scrimmage against the SWBL’s Dixie Greyhounds. Both teams scored twice when it was varsity on varsity. The Blackhawks almost had a third score, but a Greyhound interception at the 4-yard line ended that threat. The Blackhawks managed to tack on another score when the junior varsity squad’s took the field. Both teams showed the ability to pass and run. All in all it was a positive scrimmage for the Blackhawks. The Blackhawks utilized a spread offensive. The team moved the ball the best when it mixed the run and pass. After allowing Dixie to score on their first drive with a 66-yard catch and run, the Blackhawks made the next two scores. Will Hall caught an Alex Scholl pass for a 13-yard TD reception. It capped a clock eating drive. The next TD was set up by a fumble recovery. The team drove 65 yards and Scholl dove across the goal line for the last score of the half. The team did let Dixie score again in their opening drive of the second half. But bounced right back and put together a nice drive of their own. However, this drive ended with an interception on the 4-yard line. Still, the Blackhawks showed the ability to comeback and rally when the team encounters a set back. Defensively, they stymied the Dixie offense the rest of the night. “When something like this happened in the past, we would tuck our tails and it would be game over. But this is something that I preach every day – we have to keep our heads up. 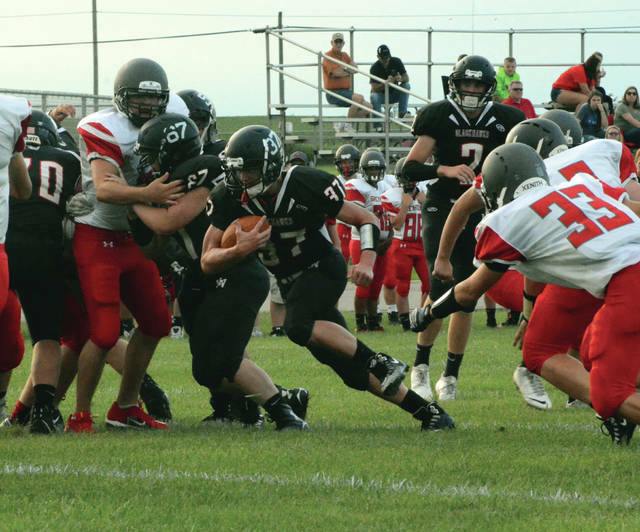 You are going to have bad moments – but it is how you respond when things go bad that makes you a better player, a better team,” said Steve Trobridge, Mississinawa Valley’s new football coach. The injury bug has bitten the Blackhawks, receiver Cameron Shimp was injured in the scrimmage before this one and is not expected back until about the third game. Next Friday, the team will take the field for real when they host Cedarville. This entry was tagged CCC, Dixie Greyhounds, High school football, Mississinawa Valley Blackhawks, Steve Trobridge. Bookmark the permalink.